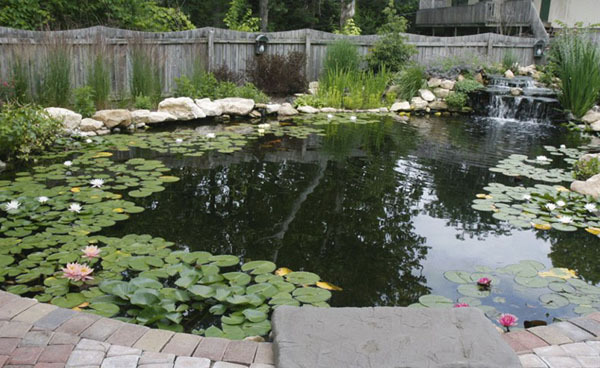 This large pond mixes together many different building materials and elements. As you can see there are large granite rocks on and around the waterfall and part of the perimeter. 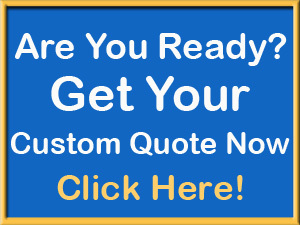 This is mixed with the pavers to incorporate the seating or deck area. It is always nice to incorporate terrestrial plants for a more natural look. I like that although this pond has a lot of aquatic plants it has some open viewing areas to enjoy whatever pond fish and Koi you may like to enjoy. 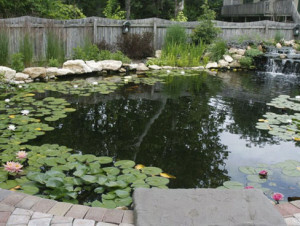 The pond contractor has a choice to build this pond in concrete but it is recommenced to use a good quality pond liner to avoid having to cure it and prevent cracks or leaks in the future.